The Chief Justice, Sophia Akuffo, has interdicted two registrars of the Adjabeng Magistrate Court in Accra who are being probed for embezzling court fines and fees. They are Mrs Patience Nai, a High Court registrar, and Mr David Laryea, a Circuit Court registrar, who is also an assistant referee. Their interdiction has become necessary so they do not interfere with an ongoing probe as auditors work to recover some missing case dockets and receipt books that are crucial to the investigations. But the audit team dispatched by the Chief Justice to investigate acts of embezzlement at the court faces a daunting task after discovering that several case dockets and receipt books that are relevant to the investigations have gone missing. The establishment of the probe and the subsequent interdiction follow three months of investigations and expose by the Daily Graphic on many court fines and fees embezzled by court registrars at the Adjabeng court. The source said the diversion of court fees and fines was an age-old practice at the Adjabeng Registry, spanning several years. A three-month investigation by the Daily Graphic has established that a fine of GH¢2,400 in the case of the Republic v. Eric Duah, paid by the convict on May 17, 2017, was diverted and embezzled by the two registrars. 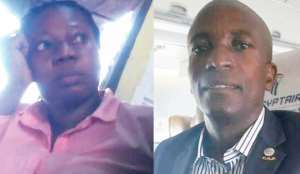 Again, in the case of the Republic v. Peter Mahamadu Seidu, the defendant was convicted to a fine of GH¢3,000, which was also not paid into the Consolidated Account but into private pockets, as usual. Though the two registrars who initially denied any involvement in the series of the embezzlement at the courts were later made to refund the money, it is unclear how much money has been embezzled by the two since the trade is said to have begun some years back. Stealing and embezzlement of court fines and fees had become rampant and widespread across the country, according to a member of staff of the Judicial Service who pleaded anonymity. He said the acts of the two registrars at the Adjabeng court were just a microcosm of the widespread stealing of fines and fees across the country's courts.